This week I read Jack Canfield’s new book The Golden Motorcycle Gang, co-written with William Gladstone. The book is centered around Jack’s personal story and his sense of purpose in life, and it invites you to consider your personal role in our ongoing social evolution. Jack imagines that before he incarnated as a human being, he was part of a gang of spiritual beings speeding through the cosmos on their merry way, and they happened upon a blue planet and decided to take a closer look. What did they see? A planet at war with serious troubles. The year was 1943. This planet was heading towards a crucial point. If it continued on its old ways, it could soon destroy itself, either with increasingly destructive weaponry, by gradually destroying the planet’s ability to sustain human life, or perhaps by descending into chaos when unsustainable systems ultimately collapsed. Acting somewhat impulsively the Golden Motorcycle Gang decided to incarnate as human beings. They wanted to help earth move in a more positive direction. Initially they forgot that they were part of this gang, but later in life the memories of their spiritual identities gradually returned, and they were able to reconnect with other members of the gang… and then to begin coordinating their efforts. The story works whether you regard this as a real soul group or simply as a metaphor for discovering one’s calling. Just consider how it might affect your life and your actions if you believed that you were a part of something like this and that you had previously agreed to fulfill a larger purpose. In Jack’s case the call to making a difference is well established. Among his many achievements, he co-authored the Chicken Soup for the Soul series, which are filled with inspirational stories. This series has spawned more than 200 books that have collectively sold more than 500 million copies. If you visit one of the remaining brick and mortar bookstores, you’ll frequently see entire sections dedicated to these books. I have a special connection to this book since I’ve been involved with the Golden Motorcycle Gang since 2009. For that reason my name is listed in one of the book’s appendices. 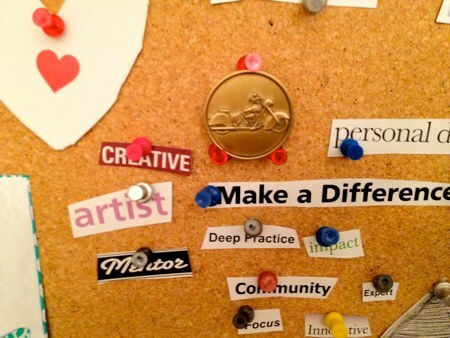 I have a golden motorcycle coin (a symbolic token of initiation that was given to me by Jack) tacked up to my vision board in my home office. I use this board to post words, phrases, symbols, photos, drawings, and artistic creations from my kids — anything that reminds me of my life purpose, goals, and dreams. If you get most of your news from fear-based media outlets, you may worry that the planet is going downhill. The economy is tanking. Wars are being fought with no end in sight. Money is corrupting everything. World leaders trash-talk each other behind the scenes. Yes, the planet has its problems, but there’s also a rising counter-reaction to these problems. More and more people are progressively waking up, and many are committing themselves to work on solutions to our greatest challenges. Our global challenges are too big for any one person to solve, so collective coordination is necessary. As many people are well aware, our economic and political systems are showing lots of cracks lately. One problem is that many elements of these systems are unsustainable. For example, we can’t achieve infinite growth from systems that rely on ever-increasing consumption of finite resources. Eventually the simple mathematics will win out. It’s just a matter of time. On the other hand, there are elements of these existing systems that actually work quite well. We don’t want to throw the baby out with the bathwater. We want to keep what works and re-engineer the parts that aren’t working. I for one feel grateful for just how well systems of business and government work in the USA. There are numerous problems of course — these systems are far from perfect — but they do accomplish quite a lot. Anarchy isn’t the answer. Even the most unconstrained parts of the Internet has shown that self-governance is a failure. Where free will is present, it just takes a few deliberate wrongdoers to wreck the whole system for everyone else. As much as we’d like to believe it isn’t necessary, at this time in our evolution we still require the foundation of force-backed coercive power to maintain a reasonable level of order, whether that power is wielded by governments or businesses. Where there’s no rule of law backed by the threat of force, things break down. Government and business systems add significant value to our lives, and life without them would be far worse. Without those systems you and I probably wouldn’t even be able to communicate. What we need is to intelligently replace the unsustainable elements with more sustainable ones. By itself that’s an achievable goal. The tricky part is keeping everything running during the transition process. We can’t simply shut everything down and replace it with something new. If we lose the structure provided by our current systems before new ones can be established, we could potentially descend into chaos, and it could take us a very long time to recover from that. We can also continue to upgrade the systems that are working poorly. Education is a good example. Many best practices are known, but they aren’t yet being implemented on a large scale. This creates rippling problems since an uneducated society cannot produce enough educated individuals to perform vital functions, particularly when it comes to leadership. There was a time when these GMG group members acted mainly as individuals — writing books, doing seminars, coaching people, and running their own independent businesses. Then they began coalescing into groups, helping to inspire, motivate, and support each other in doing transformational work. Now those groups are beginning to connect in order to coordinate their efforts on a larger scale. This is a very interesting development to witness. Group cohesion is a challenging thing to accomplish in this case — almost like herding cats. I’m especially curious to see if these groups will be able to find enough common ground to work on bigger projects that require significant cooperation. My interpretation of the GMG and similar groups and that one of their desired functions is to help us transition from the old, dying systems to new, more sustainable ones. There’s a sense of optimism as well as urgency arising within these groups. On the one hand, we have a lot of smart people now agreeing to coordinate their efforts, doing their best to keep their egos in check as they work together for the common good. On the other hand, the clock is ticking. The old systems only have so much life left in them before they can no longer be maintained. Some of these people are working on education. Others are tackling environmental issues. Some are working on basic needs. Still others work to raise awareness and teach oneness and compassion. One woman I know works with prisons. They’re making progress on the important fronts. The main question is whether progress is happening quickly enough. Instead of regarding your life purpose as your individual mission, you may find it more empowering to interpret your purpose as part of a team effort. You’re not acting alone. Your actions can be coordinated with others to have more impact. This doesn’t mean surrendering your will to a group. It means noticing where your individual strengths could contribute greater results by coordinating your efforts with others. Most members of the GMG are much older than I am, belonging to my parents’ generation. I resonate with their values, philosophies, and projects, but I can see that their paths and my path are a bit different. We’re all working on similar challenges, just from different angles. I can see how great the level of mutual support is within this group. Many GMG members have been friends for decades. Sometimes they support each other from a distance. Sometimes they work together directly. Either way they’re bound by common values and a common cause. Whereas members of the GMG often have their values rooted in the 60s, molded by such experiences as the Civil Rights Movement and the Vietnam War, my past was shaped by different events, such as the massive expansion of communications technology, the fall of the Soviet Union, the Gulf Wars, and 9/11. I was also strongly influenced by West Coast values since I grew up in California, which is where many members of the GMG currently live. I like riding with the GMG, I share a lot of love and support with them, and I can see that their missions combine nicely with my own, but energetically and soulfully, the people I resonate with most strongly wouldn’t think of themselves as members of this group. The GMG feels like family to me, but on the level of aunts, uncles, and some cousins. Lately, however, I’ve been feeling drawn to connect with the people who’d be on the level of brothers and sisters. Many of the problems the GMG is tackling won’t be solved within their lifetimes. It will be up to the next generation to receive the torch and carry it further downfield. Reading Jack’s book got me thinking about the people who might be part of this next generation, people who are currently in their 30s and 40s (and perhaps mature 20-somethings) and who want to help shift the planet in a more positive direction. I’ve met many of these people, but I feel we’re still in the phase of working primarily as individuals, mostly doing our own things while connecting socially from time to time, like many GMG members were doing a decade ago. Due to the age difference, our careers aren’t as well developed as those of the GMG. On average we don’t have as many resources at our disposal, and our networks aren’t as powerful. But we do have some key advantages. For starters we understand and can utilize technology a lot better than the previous generation. This is a generalization of course, but I don’t think it’s an unreasonable one. I’ve encountered a few networking groups for people close to my age, but they’re usually very business-centered. Often they just want to help promote each other’s products and become more successful in business. There’s nothing wrong with that per se, but such groups don’t usually resonate with me. That isn’t the kind of vibe I’m looking for. I’d rather connect with people who can direct their ambition towards making a positive difference in the world, especially people with strong service-oriented values. For many years I’ve been hearing the frustrations of this next generation. Many of them see that the world needs help, and they’d like to contribute somehow, but they see no practical way of doing this. Meanwhile they’re being influenced to play it safe, to go into the corporate world and get a job. When they do this, however, they often wind up in empty, soulless positions — if they can find work at all. They do work that just doesn’t matter that much (according to their values, not mine), but they do it because they feel it’s necessary to support themselves. Consequently, they’re never all that motivated to do their best work or to advance their career skills, so they naturally stunt their career development. Years pass, and they feel they’re falling behind, but they don’t know what to do about it. They often blame themselves and assume the problem is their lack of drive, discipline, or motivation. And they try to hold out hope that something will change for them. I think the real issue though is that our systems of business and government haven’t kept pace with our evolving consciousness. Many of these people are just too conscious to get sucked into the belief that says moving up the corporate ladder is important. They see through such shallow structures and avoid these dead-end paths, but they lack good practical alternatives. On the other hand, this generation is more connected than ever, thanks to the Internet, social networking, and powerful portable devices. Quite often these people invest more time and energy in their social lives than in their career development. Overall these people feel very pressured. There’s pressure to get something going career-wise, but the motivation isn’t there to do it. So the time gets devoted to the Internet and online socializing, and the career path gets drained of life and meaning to feed the social life. I avoided this fate by starting my own business, which is a solution I’ve recommend to others, but I understand that entrepreneurship isn’t a viable path for everyone. Many people would much rather work for someone else, and they’d love to do meaningful work that inspires them — and pays the bills. Also, starting a new business often involves spending a lot of time working alone, and younger people are so well networked with their peers that it’s harder for them to go that route. It would make more sense for them to work together in groups to do creative work as a team. Another problem with entrepreneurship is that many people get sucked into soulless business models. They gradually fall into a money-first focus that’s out of alignment with oneness, which leads to long-term unhappiness and stress. It’s sad to see the life drain out of such people when they go that route. They can’t even hug properly after a while. I love how the community around my work has grown and how people help and support each other and stay connected socially. But many of these same people (perhaps even most of them) are experiencing significant challenges in their career and financial lives. They feel stuck. Even when they do start their own businesses, long-term success is difficult. I didn’t make my first business profitable till its 6th year, for instance. This isn’t unusual for entrepreneurs. But how to pay the bills in the meantime? If we want to move away from the soulless corporate job trap as the primary career path that people of this generation settle for in order to cover their expenses, we’ll need to create more and better alternatives. Many members of the GMG are very well off financially. In most cases it took them decades to get there, but it does make service easier when you have a steady stream of royalties from bestselling books coming in, your Rolodex includes lots of influential friends, and Oprah likes you. When I look at people around my age or younger who have a service-orientated mindset, many of them are struggling in one way or another. Either they’re struggling financially while maintain a strong heart-centeredness, or they’re doing well financially and struggling in their connectedness. As I’ve seen with the GMG, it isn’t necessary to go it alone. We can help each other grow stronger, which puts us in positions to have a greater positive impact. At this time in my life, I’ve been encountering a number of people who seem like they could be pieces to a bigger puzzle. Individually they have some interesting strengths and talents, but it’s difficult for them to leverage their strengths on their own. Increasingly I’m sensing that it’s important to help connect the dots between them, whereby some of them could work together in small teams to do some interesting and beneficial work. Earlier this year I decided to grow my business by hiring more people, but I think that mindset has been too limiting. Most of the people that have been showing up haven’t been the right fit for my current business needs, but I can see that some of them might be able to work well with each other in a more flexible context. I think it would be beneficial to bring some of these people together in person and help them connect with each other. They could keep in touch online, but for the best possible connection I think a face to face meet-up would be essential. Most members of the GMG already have their own businesses, but this isn’t as common in the next generation. The next generation, however, has a major social advantage — by and large they’re really good at communicating with each other. In fact, I think many of them would crave the opportunity to work with very conscious people their own age as part of a team. It sure beats getting a mindless corporate job, and for many people it also beats working alone on their own. The key is to bring people together who are truly interested in serving the greater good in some fashion, people who have compatible values and similar mindsets regarding service — and people who are willing to work hard to become really good at what they do, so they can increase their ability to contribute over time. For many years I’ve had a vision of bringing service-oriented people together and helping to provide the support structures that would enable them to do what they came here to do. I think what’s been holding me up was trying to figure out the right business structure for that — by expanding my current business, forming a non-profit, etc. I realize now that the underlying structure isn’t that important. That’s putting the cart before the horse. I think if we can just get some of these people in the same place talking to each other and discussing ideas, the structural issues will sort themselves out. At this point the idea isn’t fully formed, so I’m tossing this out there to see where it leads. Who are these next generation people? What have they done so far that demonstrates their commitment to service? Would they be interested in connecting regularly with other “family members” who share their values?